What’s the best marking page builder? Today is round 2 of OptimizePress vs Clickfunnels. Here are 5 reasons OptimizePress just may be better for your marketing goals than ClickFunnels. 0:41 – One Size Fits All? It’s time for part two the epic sales funnel software showdown: OptimizePress vs ClickFunnels. This time we’ll be looking at the top 5 reasons OptimizePress is better than ClickFunnels. In case you missed part one, you can check out the link to it above after watching this OptimizePress review video. The first video was a ClickFunnels review that talked about the top 5 reasons ClickFunnels was better than OptimizePress. When it comes to choosing your landing page software, both solutions can do just about everything you’d need them to do. Welcome to OptimizePress vs ClickFunnels part 2! that may lead you to choose OptimizePress as the winner. When choosing your sales funnel software, you need to think beyond the funnel you are building right now. You also want to make sure that the solution you choose isn’t going to be too hard to switch or use to scale your business in the future. Sure, one solution may make more sense today, but what happens when you start getting customers and need room to grow? I should mention that you don’t want to pay too much for a great solution you don’t need yet either; there is a balance to be found and this OptimizePress vs ClickFunnels review will help you decide. 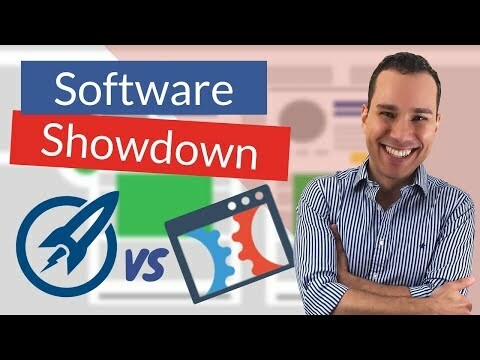 Watch now to discover the differences between OptimizePress vs ClickFunnels so you can decide which software is right for you!